Almost of the large-scale and eminent charity and non-profit organizations over the world take their first step as building a reliable and professional looking website to reach the purpose of attracting the attention of more and more people. This is undoubtfully the key to success for this particular kind of business, especially in our hi tech progress society. Of all sorts of theme for designing such a website, WordPress seems to be the most practical and best suited theme that is not only easy on the pocket but also well designed and user friendly with various features integrated characterized for the special purpose. Apart from many available free WordPress Themes for you to download instantly, if budget is not really a problem, there are numerous other responsive themes of higher quality for more choice that allow you to create a truly outstanding site. 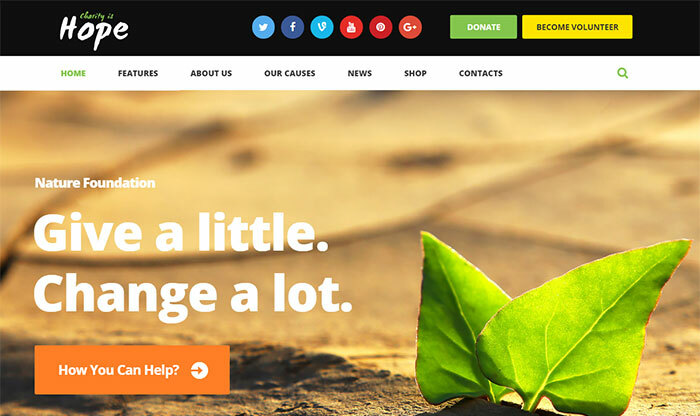 In this article, we provide you with list of 20+ Best Non-profit, Charity, Fundraising WordPress Themes catering for this kind of organizations that will surely not upset even the most prissy consumers. Find them out and make your website ready immediately! Charity Hub is a premium platform specially designed for charity, NGO, non-profit organization, donation, church or fundraising websites. 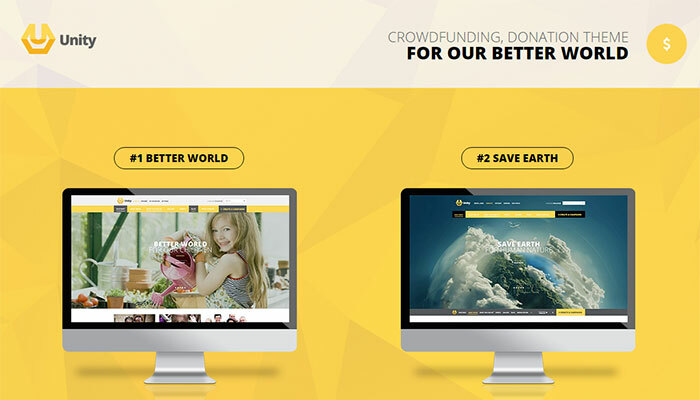 Not only does the theme come with a actually trustworthy and professional design it also contains all essential features you need for a perfect charity web. This template has up to 2 donation systems: PayPal and Stripe that allow to collect the donation conveniently and rapidly as well as respond a confirmation to the donor via email as soon as the process is successful. The amazing feature of custom post type cause is an awesome tool to manage the up to date funding for your site. Also, a large number of other useful features that contribute much to an excellent performance of your site must be listed as ‘parallax/color/full width’ section, importing demo page button , mega menu, boxed/full style, and many more. 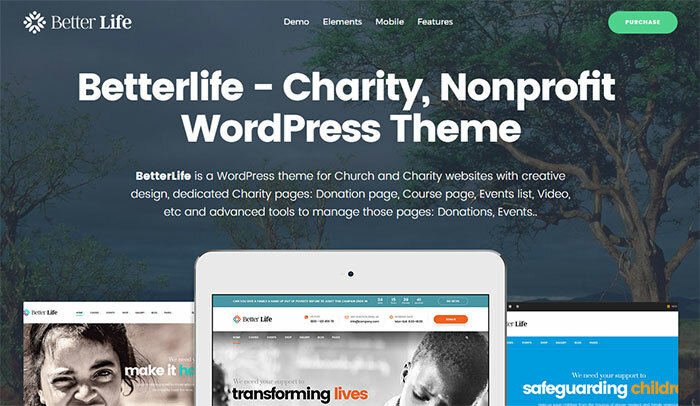 If you are searching for a responsive, highly flexible, smartly and creatively designed WordPress theme for your charity, church or non-profit organization — BetterLife is what you are looking for. This wonderful theme comes with numerous dedicated Charity pages: Donation page, Course page, Events list, Video, etc and advanced tools to manage 2 most important ones: Donations and Events. In addition, BetterLife is built with the best WordPress page builder that is extremely user friendly and help you build super stunning pages in minutes. The page builder integrated tons of widgets will save you lots of time to create content for your site. 1-click installation is also an innovation that help replicate our demo on your server in a master of second (images included). The theme is SEO friendly and optimized codebase to maximize your site’s performance. 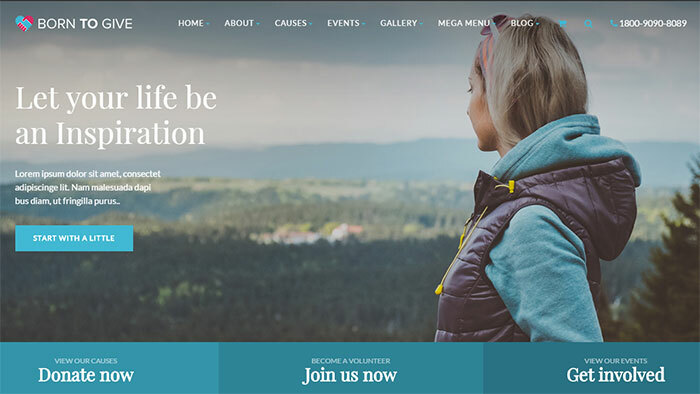 Mission is a modern and current, extensively developed and carefully crafted, creative and clever responsive premium WordPress theme perfectly suited for charity and non-profit organizations. 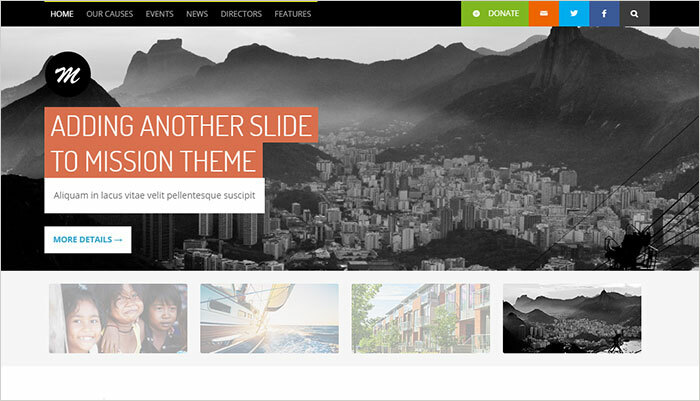 Developed by DanyDuchaine, you can find and have the theme with ease on Themeforest. Mission can provide non-profit organizations with a professional online presence. Causes Custom Post Type and Events Custom Post Type enable the webmaster to possess more useful information on the page and interaction through page. DanyDuchain integrates various color options to change unlimitedly any element of the website in the admin. Also, this is a incredibly reponsive design that can resize to fit any device screen such as computer, tablet and even mobile phone. Unity is a unique and modern non-profit WordPress multipurpose theme, best suited for the purpose of creating an attention-grabbing website that will promote your crowdfunding, performance of events, causes and public awareness campaign to the public. Unity is built on top of Easy Digital Downloads and Crowdfunding by Astoundify, two free, open-source plugins. This super flexible module enable you to set up everything simply with visual composer. You can easily create or change the site that meet your most strict desire. Unity is not just a super flexible theme, it is the combination of tons of useful features such as Slider Revolution, Integrated Mega Menu Module With Lightweight Megamenu Editor Tool, Visual Composer, WooCommerce Ready, Multiheaders and Unlimited Footer Layouts that will help you create a amazingly professional and totally comprehensive website ever. No more hesitation, get the ball going, with Unity! Wisdom of Life is well known as a clean and elegant theme developed by Themebazaar for the main purpose of setting up NGOs, non-profit organizations and corporate websites. Using the color scheme as your wish by using color picker make it elegant and high visual impact experience. This templates was updated with Multilanguage Support, Donation widget (allow you to add raised money manually) and Main Slider. By purchasing this theme, you can benefit from a prompt and effective support of the developers. Theme works in all the major browsers, and has massive features to use for your next projects as well. Eco Nature WordPress Theme is a perfect choice to build a website for organizations founded with the mission of protecting the enviroment, preserving the ecology, or raising public’s awareness of global warming precisely like a non-profit ecological or nature resources organization, an environment preservation company, a fundraiser for green peace or eco energy. The theme is incredible responsive that make it look extremely striking on whatever electronic devices. Unlimited design solutions can be created due to a great flexibility of settings and shortcode options. Custom Profiles and Projects post types offer an optimal way to present your ecology content. The theme includes a variety of core features that can be listed as Custom Mega Menu plugin, a really functional Form Builder and premium Revolution and Layer Slider plugins included for free. Moreover, Multilanguage, RTL-ready, plugin-compatible and professionally-supported theme will make every day you work with your website be a great experience! With a special Donations functionality support, you can collect paypal donations for your ecology project, to save nature, animals and organic life. 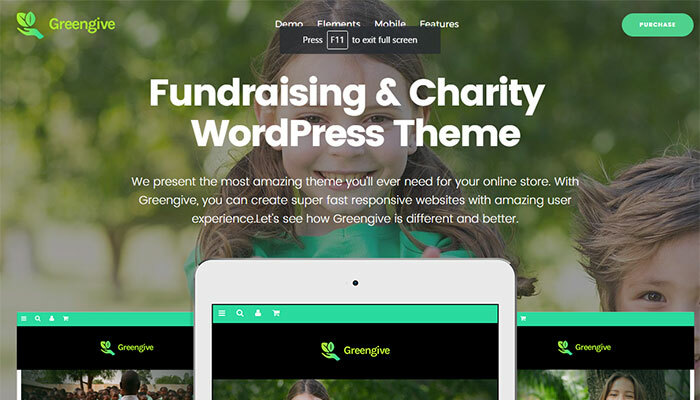 Greengive is a unique, thorough, all-encompassing WordPress multipurpose theme perfectly designed for Fundraising Website, Charity website, non-profit website, GlobalGiving, iCharity website, Charities aid Foundation, Child aid, World Wildlife Fund…Opal team have spent years in the field, identifying the most critical functions then included them into this theme package.The primary purpose of this charity WordPress theme is to get more donors to charity projects, not to distract its users by showing off your projects & causes in the best way. The integration of the updated function 1-click installation can help effectively replicate our demo on your server in a master of time. Moreover, Greengive is built with the fastest page builder that helps you to make your own beautiful page with no coding. 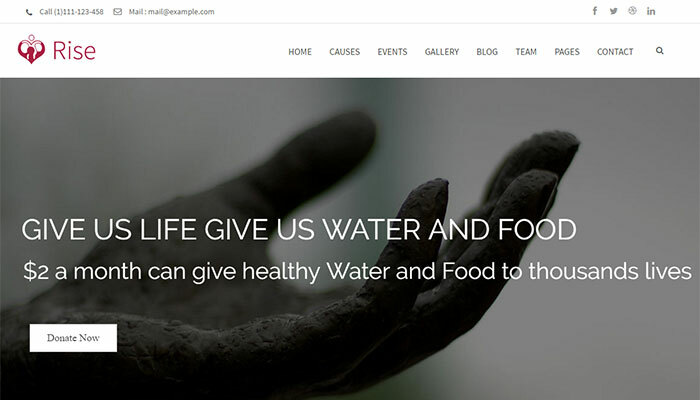 Hope is a highly flexible and fully responsive custom-crafted premium WordPress theme best suited for any charity, NGO, donations, foundation, fundraising or governmental social program website. Hope includes all the necessary theme features that your nonprofit website could possibly need. Designed by ThemeRex, the template is integrated with a powerful ThemeRex Donations Plugin for your fundraising campaigns or charitable trusts and many other useful key features such as One click demo install, Revolution Slider for your homepage while Swiper Slider for posts and galleries, various awesome hover effects and many more…All elements to ensure a best performance for your unique professional and trustworthy site. The theme is fully responsive and 100% Retina and SEO ready and fully supported with detailed HTML documentation. 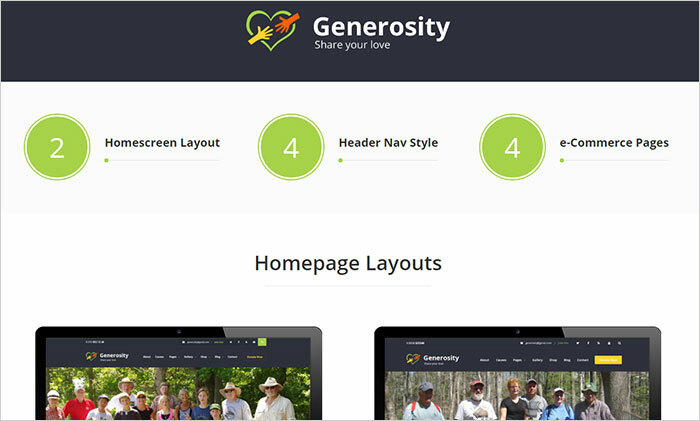 Generosity is well known as a totally responsive WordPress theme that certainly works great as a platform of any charity, non-profit, and fundraising websites. The theme is highly rated by hundreds webmasters all over the world for its awesome performance in informing people about their cause raising money to make their mission successful. Generosity is perfectly compatible with some useful plugins like Visual Composer, WooCommerce, Multilanguage WPML support so that you can create gallery, projects page, volunteers page, donation page, donation form especially Page for Donation (PayPal). You have great chance to make this world better, and show everyone that it is not so difficult to give thing away. 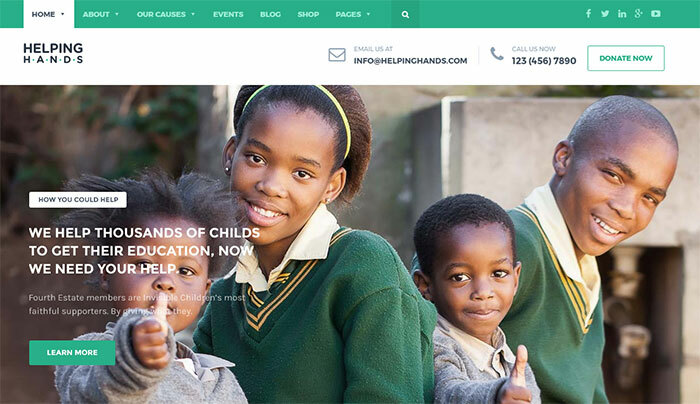 HelpingHands is a really powerful well responsive premium WordPress theme designed for charity, NGO, non-profit organization, donation, church or a fundraising website. This eye-catching theme also includes features to cater the special needs of most non-profit organization like raising funds, encouraging people and promoting their causes. PayPal and other payment processing gateways are availably integrated to ensure donating convenience. One Click Demo install allows everyone, even those without any programming experience, to be able to set up the theme easily and rapidly. Helpinghands is highly appreciated not only for great quality of the theme but also excellent customer service that makes many consumer satisfy. 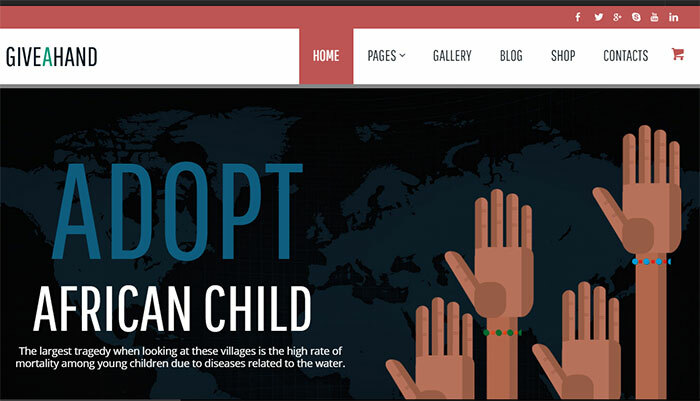 The clean and responsive design of 4 Children With Love makes it a brilliant choice for your non-profit website. It is a charity theme dedicated to children but don’t let the name limit your creation as in general it is also suited for any kind of charity and non-profit organizations. 4 Children with Love” is fully responsive WordPress theme that includes fully functional shop built on WooCommerce plugin. It uses basic, core WordPress options (pages,post,categories) to create site that is easy to use for both beginners and advanced users.The theme can be easily customized to fit any requirement of admin thank to various options included as well as boundless flexibility. Its responsive design allows your website to perform efficiently on different Browsers, Smartphones and other mobile devices. Animal Care is a powerful, functional and features rich responsive WordPress theme that is suitable for any non profit animal related organizations such as wild animal sanctuary, homeless animal rescue site, saving endangered animal group and so on. The theme is user friendly and highly flexible that lets you customize a wide variety of features from the comfort of your Dashboard. Many wonderful and useful plugins and features are packed and ready to use without need of installation. Moreover, this is such an amazingly reponsive design that can resize to fit any device screen such as computer, tablet and even mobile phone. Animal Care is continually updated for new version to best satisfy any user. 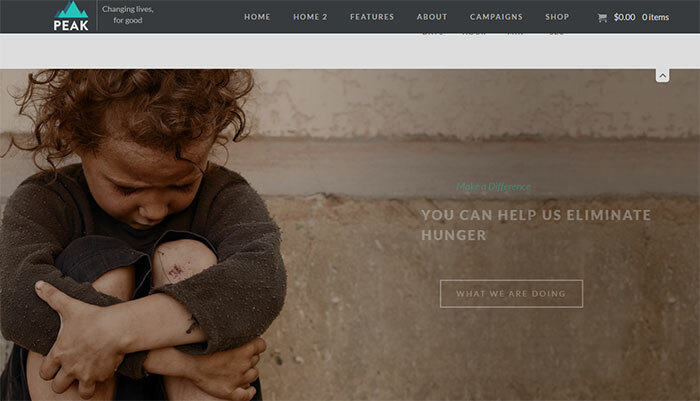 Be Human is a non-profit theme for WordPress built to accommodate the distinct needs of charity and non-profit organizations. The theme is a retina-ready, responsive WordPress theme featuring tools like IgnitionDeck to support crowdfunding. It also has full design integration for WooCommerce that allows you to sell stuff for a cause.The main features, which are extremely important and super useful are, Events Calendar & Management, Multilingual support, 3D Layer Slider and Facebook fan page compatibility. Like other WordPress theme, Be Human is extremely easy to use and doesn’t require any previous coding. Belief is considered as a responsive premium WordPress Church theme with a salient powerful drag-and-drop layout builder intended to power non-profit, religious communities, church or charity sites. It uses a framework that permits the site to be accessed on all mobile devices, including iPad and Android powered tablets. You can have multiple blog layouts: grid view, thumbnails view, timeline or list view and choose between the image resize method: resize or crop. Also, you can set different colors for your body and headings. Not lthe least, you can add background images for individual posts or for the whole site. The theme comes with several predefined background patterns, as well. “Born to Give” is a fully functional WordPress Theme designed & developed for Crowdfunding, Charity or Non Profit Websites and comes handy for Corporate Business Websites as well. It is fully responsive template based on Twitter Bootstrap 3x framework that makes it available for all screen sizes from the bigger ones to smartphones. It’s not only responsive whereas it is retina ready also, now no blurry images on your HiDPI and retina devices. Other outstanding features includes: Visual Composer Page Builder, WPML Ready, Slider Rovolution, Built-in Megamenu, 1500+ Retina Ready Icon, One Click Import, and many more. 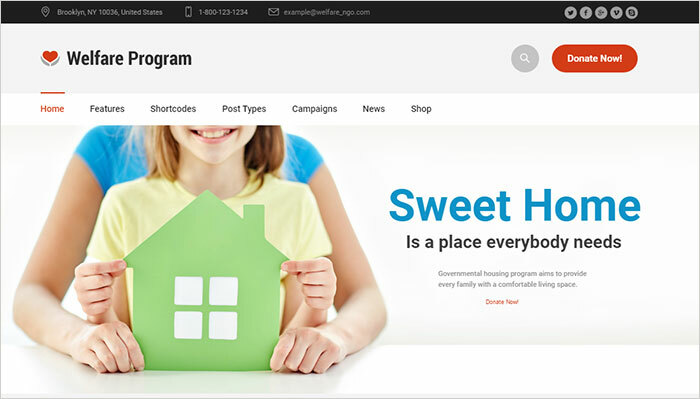 Welfare NGO Charity WordPress Theme is created for non-profit websites, like governmental social program websites, NGO, Donation and fundraising websites, etc. Welfare NGO theme features fully designed and integrated The Events Calendar and The Events Calendar PRO plugin compatibility (PRO addon needs to be purchased separately as the plugin does not provide a license to include it), as well as Menu functionality. You can add events and calendars on your website as well as display your dishes and allow ordering. It has anything a restaurant website will need. Key feature of the theme is a custom CMSMasters Donation plugin, that comes included in theme archive. You can create fundraising campaigns, collect donation for any welfare and social programs, run multiple different donation campaigns at a time, show progress for each campaign and even showcase some donators to inspire other people. 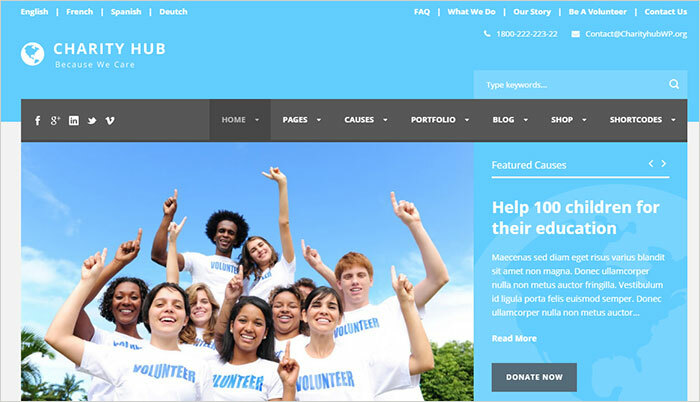 It’s a fully responsive and powerful charity theme designed to help raise funds and spread awareness efficiently. The theme comes with a lot of extras such as PayPal donation functionality and WooCommerce support for collecting funds. You can play with some web design elements using its Perfect jQuery and CSS3 animation. GiveAHand also includes a parallax slider The template is built on the twitter Bootstrap framework and has an optional YouTube video background and plenty of widgets and shortcodes. It’s perfect for those who’re tired of ordinariness and want to stand out among competitors. 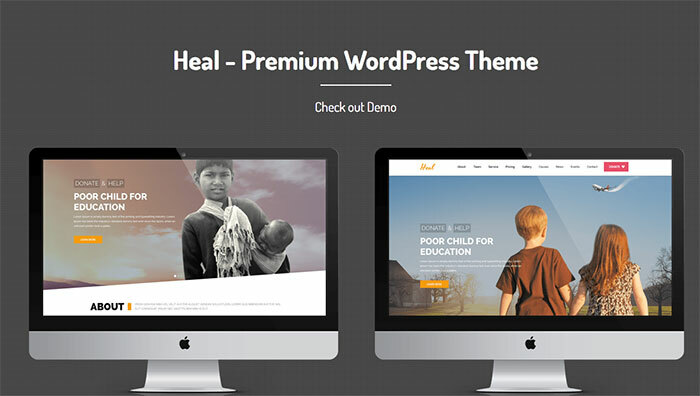 Heal is a clean, flexible premium non-profit and charity WordPress Theme that can be used to build a gorgeous website for an NGO or Charity foundation project. 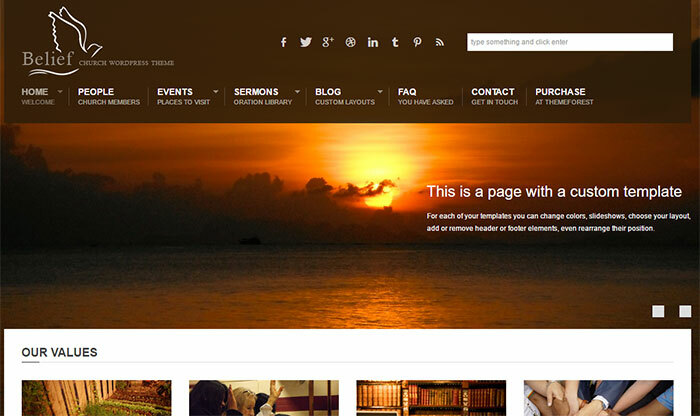 This theme comes with a very fluid and solid framework, which is built based on Bootstrap 3.1.1. It is carefully handcrafted using valid HTML5 and CSS3 coding to help you keep pace with the latest trends in website design. It is completely responsive and resizes sleekly on tablet, mobiles or desktops to give your visitors an incredible user experience each time they visit your website. 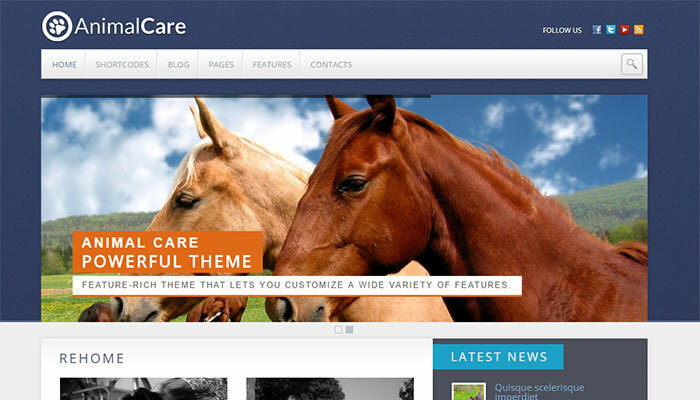 Heal WordPress theme also loaded with tons of features and has a powerful customization option panel. The theme also comes with a built in PayPal donation system which allows you to accept payments or donations online. In addition, ranking at first page of major search engines is not a problem with this theme since it is well-coded and fully optimized for SEO. Peak is a charity theme for non-profit organisations. The theme integrates with well regarded Give Plugin and Tribe Events Calendar plugin. Give plugin is quite versatile and provides features like multitude of payment options (via paid plugins), transaction mgmt, reporting capabilities for income generated etc. 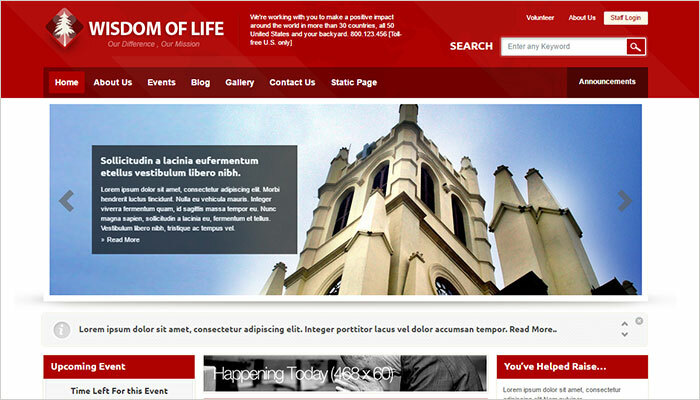 The theme pages are built using popular SiteOrigin page builder. Peak comes with support of about 40+ custom page builder elements/widgets that are accessible for easy insertion and configuration in the page builder including the ones that are part of popular SiteOrigin widgets plugin. So, building a great charity website is now as easy as drag/drop/configure and publish. Finally, the theme also integrates with WooCommerce to help non-profit organizations sell goods for raising money. Rise is a minimal but professional Non Profit concept for NGOs and Charity website to create a quick & easy donation collection platform. Looking fantastic on retina devices, with beautiful typography and those small details that really make you stand out from the crowd. The theme comes with Projects, Causes, Events style, blog in different styles, unlimited color schemes and lot more. Rise is highly customizable with unlimited combinations with powerful and flexible theme options, included page builder, HTML5 & CSS3, Visual Page Builder Revolution Slider, HTML5 website files included, WPML – Multi Language Ready, Unlimited Color Schemes, Twitter Bootstrap 3.1. The theme make holds with blistering parallax effects, eye-catching hover animations, and more shining features. And so it is the perfect time to click the purchase switch and bright up your online future. In conclusion, The list “20+ Best Non-profit, Charity, Fundraising WordPress Themes 2017” above contains some of the most awesome themes best rated by many webmasters in the world. Hoping via this list you can find out exactly the most suitable one for your upcoming project. For more choices, you can also visit our Portfolio on Themeforest for many other useful multipurpose WordPress Themes. After you purchase our themes and meet any problems, don’t hesitate and contact us via email support: help@wpopal.com or submit a ticket on our system: http://bit.ly/2klTrX2. Our technical team will check and fix them well.